Add a touch of class to your special occasion with a cake decorated to perfection by Speciality Cakes. 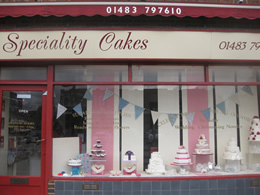 Speciality Cakes is a small family run business based in the village of Knaphill, Surrey. Owned by a mother and daughter team, Rosmary and Sarah Trudgett, for the past 14 Years. The cakes are baked and decorated on the premises to the highest standard by the college trained, award winning cake designers. Our cakes taste as good as they look. We look forward to meeting you in our High Street shop where you can sample our delicious range of cakes. Free parking in the High Street.